Rutgers researchers have developed a technology that could overcome a major cost barrier to make clean-burning hydrogen fuel – a fuel that could replace expensive and environmentally harmful fossil fuels. 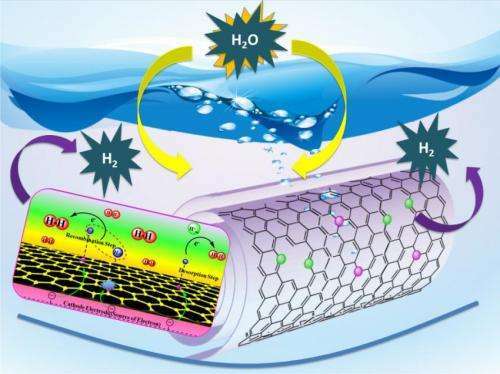 The new technology is a novel catalyst that performs almost as well as cost-prohibitive platinum for so-called electrolysis reactions, which use electric currents to split water molecules into hydrogen and oxygen. The Rutgers technology is also far more efficient than less-expensive catalysts investigated to-date. "Hydrogen has long been expected to play a vital role in our future energy landscapes by mitigating, if not completely eliminating, our reliance on fossil fuels," said Tewodros (Teddy) Asefa, associate professor of chemistry and chemical biology in the School of Arts and Sciences. "We have developed a sustainable chemical catalyst that, we hope with the right industry partner, can bring this vision to life." Asefa is also an associate professor of chemical and biochemical engineering in the School of Engineering. He and his colleagues based their new catalyst on carbon nanotubes – one-atom-thick sheets of carbon rolled into tubes 10,000 times thinner than a human hair. Finding ways to make electrolysis reactions commercially viable is important because processes that make hydrogen today start with methane – itself a fossil fuel. The need to consume fossil fuel therefore negates current claims that hydrogen is a "green" fuel. Electrolysis, however, could produce hydrogen using electricity generated by renewable sources, such as solar, wind and hydro energy, or by carbon-neutral sources, such as nuclear energy. And even if fossil fuels were used for electrolysis, the higher efficiency and better emissions controls of large power plants could give hydrogen fuel cells an advantage over less efficient and more polluting gasoline and diesel engines in millions of vehicles and other applications. In a recent scientific paper published in Angewandte Chemie International Edition, Asefa and his colleagues reported that their technology, called "noble metal-free nitrogen-rich carbon nanotubes," efficiently catalyze the hydrogen evolution reaction with activities close to that of platinum. They also function well in acidic, neutral or basic conditions, allowing them to be coupled with the best available oxygen-evolving catalysts that also play crucial roles in the water-splitting reaction. The researchers have filed for a patent on the catalyst, which is available for licensing or research collaborations through the Rutgers Office of Technology Commercialization. The National Science Foundation funded the research. "Hydrogen has long been expected to play a vital role in our future energy landscapes" LMAO!!!! Whatever dude. Hydrogen is an energy carrier, not a source of energy. You have to spend energy to separate it and energy to store it and to transport it and to pump it under extreme pressures. All of that TAKES energy to use the hydrogen. It's only viable in situations where the hydrogen is already produced as a by product of some other industrial process and then only for local use. You guys have GOT to stop lying to people about this. I don't see it. With battery technology advancing practically before our eyes, what's the point of carrying electricity via hydrogen (which is what it comes down to) versus carrying electricity directly? By the time hydrogen is ready for prime time it will be moot. I see nothing about a reduction in the amount of electricity required. Unless someone can find a way to separate H2 with much less energy, the cost per mile is simply going to be a killer for FCEVs. Right now it takes about 2x as much electricity per mile with a H2 FCEV as an EV. All this improvement would do is lower the infrastructure costs added to the extra electricity costs, bringing the cost per mile down closer to 2x. I think you're getting confused about the purpose of hydrogen in a post fossil fuel world. It is an energy carrier - that's exactly the point. It's meant to replace petrol. You must be thinking to yourself now "but it takes fossil fuels to make the energy required to produce hydrogen!!!!" We have nuclear, hydro, wind, geothermal, tidal and solar at our disposal. @zorro - At this point in time I see H2 FCEVs as our safety net in the event we don't develop adequate range (~200 mile), affordable EVs. However I'm not betting against continued capacity increases and price decreases. I think we'll be where we need to be within five years. @rhsthjnty - All those low carbon electricity generation technologies you list? We've have to build >2x as much if we drove H2 FCEVs. Coal may be cheap as all hell but that's only when ignoring the total costs. When health(immediately) and infrastructural(later) costs attributable to pollution and global warming are taken into account coal is actually fairly expensive. That's where carbon credits come into account and try to correct the price - but that's a whole other conversation. Some states/countries are better placed technologically and geographically to generate low carbon cheap H2. If the technology matures correctly, I see a world H2 market. Hydrogen is an energy carrier, not a source of energy. Exactly. Energy can be produced cheaply in certain locations, that tend to be a long way from your car and house. You just need a way to get it from the production facility to its point of use. Let's say a large solar array in the desert stores the collected sunlight in the form of split water. Or a hydroelectric plant, or nuclear plant, or any other plant. The energy is transported in fuel cells or hydrides or what have you to the place of consumption, e.g. your car or your house. Energy is released from the fuel cells, where your only byproduct is water, rather than hydrocarbons and CO2. Depleted fuel cells can be recharged from the production facilities. In other words, energy storage makes the green, renewable energy sources viable, and hydrogen (and advances like this one) implement that storage. @rhsthjnty - We should do what? Build twice as much renewable generation than we would need for EVs in order to drive FCEVs? I'm not seeing the logic in that. @SoyentGrin - Same point when it comes to transportation. Driving with H2 requires twice as much energy generation. Storage is likely not needed for EVs, they are built around storage. Cars spend about 90% of their time parked. The average driver (13,000 miles per year) needs to charge less than 3 hours of that 21.6 hours and, to a great extent, it won't matter what time the charging happens. Smart grids and smart chargers can pump power into vehicle batteries when supply is favorable and throttle back when demand taxes supply. We'll probably see a lot of charging done during peak solar hours and late night hours when onshore wind is kicking. H2 for deep storage. As/more likely we'll make our PuHS reservoirs larger or add additional tanks to flow batteries. It will come down to efficiency and cost. We know there's a 50% loss when using H2 as a storage medium, just separating out the H2. Long term H2 would be less than 50% efficient. Then toss in the inefficiencies on the fuel cell level. PuHS, on the other hand, is over 80% efficient. And H2 is a tricky little devil, hard to keep bottled up. @Bob - I misunderstood your response. As for the amount of expense and infrastructure we should input as a society regarding alternative fuels - may the best and most efficient, while taking into account the total environmental cost, solution win. I have no preference.
" I have no preference." And neither do I. But I do see how things are playing out at the moment. As I said, FCEVs, IMHO, are our safety net. Worst case, we'd switch to clean fuel (RE H2) and drive per mile for about what we're not paying to drive with dirty fuel. Perhaps a little cheaper as wind and solar prices continue to drop. For trucks it would be a lot smarter to move to electrified rail and use trucks for the "last mile", from rail siding to factory/warehouse. Running a large truck on batteries with a 100 mile range is doable. And trucks running out of a rail siding would be excellent candidates for battery swapping. Ships. Wouldn't carrying enough H2 be a problem? Perhaps we should be looking at some other form of synthetic or biofuel. I think that you are refering to Rossi. His e-Cat is doing very well thank you. This book may cause severe cognitive dissonance, which is either invigorating or fearful, depending on your peronality type. Wouldn't carrying enough H2 be a problem? It would cut into the loading capacity somwehat. 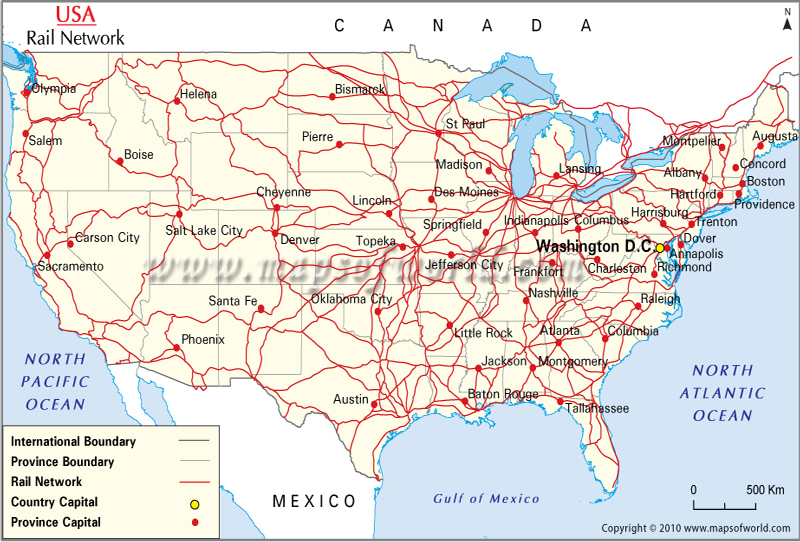 But given that there are shipping ways (much like highways). One could envision floating solar/wind powerplants for resupply. "This would require that all roads (or at least all major highways) be fitted with electrified rails. In every country." No, this would mostly mean that we electrify our existing rail system. The idea would be to get rail within 50 or so miles of everywhere large trucks now haul stuff as much as possible. Europe already uses electric rail. The Trans-Siberian Railway covers 9,288 kilometers between Moscow and the Pacific port of Vladivostok, or 5,771 miles. It was converted from fuel to electricity. Wouldn't it be easier and perhaps more efficient to just split the H2O medium that they are travelling in and use that? So if this proves out will history end up crowning George the Younger as the true environmental visionary of our era? what is the economic solution to that? Which is faster/more feasible given the level of tech today? which is better/cheaper/more viable in the long run? How do you then move the largest items that require the largest trucks? I'm going to do some quick and dirty math. 2 kWh/mile is about 6x of the Tesla S 0.33 kWh/mile. The S has an EPA range of 265 miles, so reduce the pack size by 2.5x for 100 miles. 6x / 2.5x = 2.4 Tesla X battery packs to haul a load 100 miles. The S battery pack stretches from front axles to rear axles, is roughly the car width, and appears fairly thin. Three packs racked one above each other with the cab on top would probably make for a lower cab than trucks now use. Edmunds reported a 100% recharge in 59 minutes on their S, starting from 38 miles left in the battery. That was a rate of 196 miles per hour. A 100 mile range battery could be charged in an hour, faster than a truck could get from station to station. With careful management the number of spare batteries could be kept low. Less than one spare set per truck. Better Place demonstrated automated battery swapping in less than a minute for EVs. Pull into the swap station, the front of your tractor opens, a simple device snatches the entire battery pack out and another slides in a charged pack. Close the "grill" and you're back on the road. Ports are already using battery powered trucks to move storage containers around. We've got large mining equipment running on batteries. Big stuff loves electricity - electric motors are instant full torque. 2 kWh per mile. Purchased on contract probably means <10c/kWh. $0.20/mile for "fuel". I found a site claiming 6.5 MPG. Diesel is averaging $3.90/gallon this week. $0.60/mile for diesel. $0.40/mile savings. Maintenance? No idea what it costs to keep a truck on the road - oil changes and all that stuff. That's a savings.
" over-the-road truck drivers average from 100,000 to 110,000 miles per year" ? $0.40/mile savings * 100k = $40,000 per year. That would pay off the extra batteries in one year (assuming one set). With your driving experience how about diving in here and tell me if I'm off base. If you're hauling at 40mph, you're going to have to pay 33% or more for the man hour difference of operation compared to a 60mph+ diesel rig now. I'm not sure what that will come out to on a driver's annual wage, but that will have to factor into the calculus of cost of adoption. If you're haul "that last mile" through urban traffic and over mountain roads you're not going to be doing all that much >40 mph driving. Remember, the train is doing the long range, higher speed stuff. Fuel cells are easier to refuel and easier to maintain than batteries. Fuel cells perform better in cold weather than batteries. The cost of building a Proton Exchange Membrane fuel cell may be reduced if the Platinum catalyst can be replaced with Carbon nanotubes. This is a welcome result. "Fuel cells are easier to refuel"
It's easier to drive to a service station and fill your tanks than to plug in at home? Or park over a wireless charger?
" easier to maintain than batteries"
There's no maintenance with lithium-ion batteries. There is/was a thermodynamic study some years ago that showed quite definitively that even if Hydrogen was free then it would still be too expensive to use. From what I recall it appeared to be valid with a minimal set of imponderables, unfortunately I havent seen it for approx 20years and wonder if anyone (recently) has gone through the process of doing such a study including, or otherwise, the issue of transportation & that doesnt just mean the liquid/gas but the electricity or other resources to extract hydrogen in the first place ? @topkill said, "Whatever dude. Hydrogen is an energy carrier, not a source of energy." Fossil fuels are also only energy carriers for the solar energy it took to make them long ago. I don't think we actually make any kind of energy, ultimately it all stored energy from the sun or cosmic sources. not quite. fossil fuels require less energy to manufacture than they produce though combustion. H2, alas, does not. The best solution is to build 100 1000 megawatt fission plants and dedicate them to create H2 through electrolysis and drinking water through distillation. Transporting H2, a greenhouse gas, at such a scale would be an expensive Nightmare ! Do you really want 1000 nuclear plants built down to a price with cost pressures re safety and humans involved in managing radioactive material that can so easily pollute and puts us ALL at risk, ? Shootist, have you forgotten Fukushima ? Shootist, have you not also been looking at this, are you lacking in scope ? Well since in the future we will have a major problem with fossil (mainly gas and crude oil) i presume we will have 2 schools of reason that will try to fight for the market: hydrogen and syngas. Both are energy carriers and the source will probably be green (hydro, wind, solar, geothermal, tidal, etc). As for electric vs fuels (h2 or carbon neutral fossils) it all comes down to energy storage capacity relative to volume (and maybe mass) and the overall cost of the storage unit. I don't think the greens will be happy. H2 is burned and becomes di-hydrogen monoxide. Di-hydrogen monoxide is 95% of all green house gases in the atmosphere absorbs far more wavelengths than CO2. ..Di-hydrogen monoxide is 95% of all green house gases in the atmosphere absorbs far more wavelengths than CO2. CO2 has no such mechanism, so to imply water is somehow worse is disingenuous and intellectually dishonest & misleading bias by such implication. Without the extra CO2 we have emitted since the start of the industrial revolution which hangs around a much longer time we would have less heat retention and therefore less water vapour in the atmosphere - do you not appreciate or understand that connection ? that statement of faith not of empirical science. Your belief in the 'magica properties of metaphysical CO2' does not match real world experience and physics. Really cool! I wonder how they would scale up? I was surprised to read that they can recharge in an hour... that would change things drastically. Do you have a link so I can see the info? Heck, I am interested in this myself! the amount fluctuates. The regular maintenance like tires and oil changes are easy to think about... but then trucks run 24/7 with a team driving them, only stopping for fuel, food/body functions and deliveries/pickups. You are obviously not educated in basic science, experimental methods, observations & sadly mathematics. Thermal properties of CO2 have been known for over a 100 years - no "magica". Easy to demonstrate in a laboratory, extending that mathematics to the atmosphere in relation to concentrations is not a difficult exercise, chemical engineers do often. My eldest son is a chemical engineer, I am an Electronic Engineer, we know how experiments are crafted, we know how laboratories operate, we know how to perform calculus & other higher mathematics. CO2 in the atmosphere does not act differently to a lab just because of scale or contact with water vapour, they are separable due to mathematics ! Go away & speak to an atmospheric scientist & get some physics education. If this is federally funded, why are these guys getting the patent? Surely the government (and, therefore, the people) deserve half of the patent. That would be one way to fund our government considering the Repthuglians efforts to defund it. That's the most nonsensical statement of the month. If H2 released more energy than it took to produce you would have created a perpetuum mobile. That's like asking a battery to deliver more juice than you put in it and moaning about that batteries therefore shouldn't be used. It is clear that Shootist & those like him haven't had the fortune or interest in being disciplined in language just as one gets disciplined in the study of Science such as engineering where precision & a sense of pedantism? can be so very important as safety can really depend on it. Now if only they could find a way to give it more BTUs so it could do some good work. At 340 BTU per standard cubic foot. (NG is 1040 BTUs per st. cu. ft.) IT take 3 feet of H2 to do the work of one CH4. not very efficient.